It’s hard to prove beyond doubt a direct causal link between militancy and Saudi-inspired ultra-conservative forms of Sunni Muslim Islam. That hasn’t stopped Belgium’s parliament from attempting to wrest control from Saudi Arabia of Brussel’s downtown Grand Mosque after three years in which Belgians played a prominent role in Islamic State attacks in the Belgian capital as well as Paris. At first glance, the battle for the mosque, Europe’s largest and most influential Saudi-funded institution that in 1969 was leased to the kingdom rent-free for 99 years by Belgian King Baudouin in a gesture of friendship, constitutes an attempt to counter militant Islamic ideology. It raises nonetheless prickly issues. Breaking the contract would amount to equating various strands of Saudi-inspired ultra-conservatism with militancy and political violence – a tenuous assertion given that it propagates Muslim supremacy but in a majority of its expressions rejects violence and often refuses engagement in politics. That is not to say that militants and ultra-conservatives do not draw on the same textual sources, deny that some militants hail from ultra-conservative backgrounds, or ignore the fact that Saudi-inspired ultra-conservatism has fuelled intolerance and greater conservatism in countries like Pakistan, Malaysia and Indonesia. Belgium boasted the highest number of Islamic State foreign fighters per capita of the population. Breaking the contract would also put the Belgian government in the awkward position of determining what constitutes good or bad Islam, raising questions of whether that is the role of a democratic administration, and potentially compromising the separation of church and state as well as freedom of religion and expression. A Belgian move to break the contract, which could take up to a year to complete, would create a precedent in Europe and beyond that the kingdom may not welcome, despite a vow earlier this month by Crown Prince Mohammed bin Salman to move Saudi Arabia, that adheres to Wahhabism, an 18th century puritan and literal interpretation of Islam, to an undefined, more moderate form of the faith. Some analysts suggest that a Belgian move would strengthen his efforts to curb the power of the kingdom’s ultra-conservative religious establishment derived from a power-sharing agreement with the ruling Al Saud family that dates to the founding of Saudi Arabia. Ultra-conservative religious leaders have bent over backwards to endorse Prince Mohammed’s reforms and the rollback of their powers, despite evidence that they have misgivings. The battle for control of the mosque also has implications for escalating tension between Saudi Arabia and its arch rival, Iran. The Brussels mosque is operated and funded to the tune of $1.2 million a year by the World Muslim League, a government-sponsored group, that for decades served as a prime vehicle for the propagation of Saudi-inspired ultra-conservatism. The League, whose staff was believed to be close to the Muslim Brotherhood, was a major beneficiary of up to $100 billion that Saudi Arabia invested globally over the last 40 years in religious and educational facilities as well as groups that often adhered to ant-Shiite, and by implication, if not explicitly, anti-Iranian positions. The League’s secretary general, Mohammed bin Abdul Karim Al-Issa, a former Saudi justice minister, has in the last year sought to project the group as “a global umbrella for Islamic people that promotes the principles and values of peace, forgiveness, co-existence, and humanitarian cooperation” by organizing inter-faith conferences and meeting the Pope. Mr. Al-Issa has also positioned the League squarely behind Prince Mohammed by backing the Saudi-UAE led diplomatic and economic boycott of Qatar and allegations that the Gulf state supports extremism. A prominent Indonesian scholar, wittingly or unwittingly, lent justification to the Belgian move rooted in calls for the furthering of a more tolerant, pluralistic, European version of Islam by unequivocally linking ultra-conservatism to extremism. “There is a clear relationship between fundamentalism, terrorism, and the basic assumptions of Islamic orthodoxy. So long as we lack consensus regarding this matter, we cannot gain victory over fundamentalist violence within Islam,” said Yahya Cholil Staquf, the 51-year old general secretary of the Nahdlatul Ulama (NU). NU, one of the world’s largest Muslim movements that was founded almost a century ago in Indonesia in opposition to Wahhabism, but includes prominent figures who espouse Saudi-style anti-Shiite and anti-Iranian attitudes. The mosque is a mere 16 kilometres from Molenbeek, Belgium’s second poorest neighbourhood, that emerged as a hotbed of militancy, with many of the Belgian perpetrators of attacks in recent years in Paris and Brussels hailing from the area. At least two Belgians, who travelled to Syria to join the Islamic State, studied Islam at the mosque, according to Belgian intelligence. A Belgian parliamentary inquiry into last year’s attack on Brussels’ international Zaventem airport and a metro station in the city in which 32 people were killed, advised the government to cancel the mosque contract on the grounds that Saudi-inspired ultra-conservatism could contribute to extremism. Saudi-inspired “Salafist sentiments are solidly anchored in the minds of Muslims in the Belgian capital. Belgian authorities have been playing with fire for 30 years,” said Michel Privot of the European Network Against Racism. Mr. Privot estimated that 95 percent of Muslim education in Belgium was provided by Saudi-trained imams. The cable noted that “according to the OECD (Organization for Cooperation and Economic Development), unemployment among foreign-born residents is twice that of indigenous Belgians… Saudi Arabia continues as a source of material support to the Islamic community. A member of the Muslim Executive told us that the Saudi embassy keeps mosques furnished with Korans and help with such material needs as mosque upkeep and repair,” the cable said, referring to the Belgian Muslim community’s umbrella organization. Controversy over the Brussels mosque has simmered for several years. In 2015, the Belgian government advised Saudi ambassador Abdullah bin Yahya Almoa’limi that it had problems with the mosque’s director, Khalid Alabri, who was also on the embassy staff. “His sermons were Salafist, anti-Israel and anti-West. The guiding principle was the primacy of Salafism above all else,” a worshipper told Belgian Radio and Television RTBF. Mr. Alabri was quietly removed from his post. 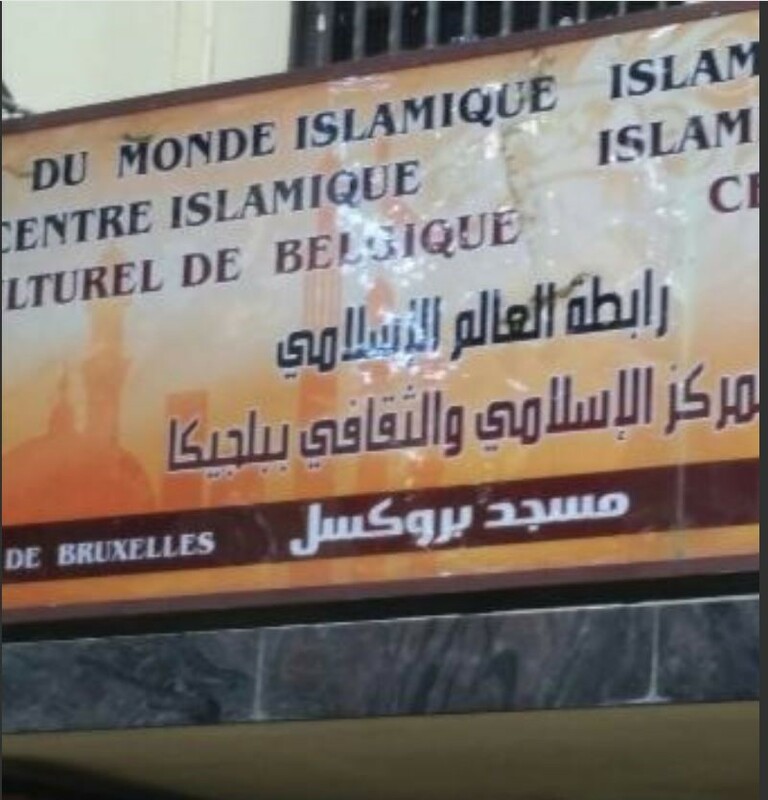 In the latest round, Belgium is effectively expelling the mosque’s recently resigned imam, Abdelhadi Sewif, an Egyptian national, by refusing to extend his residency permit because he used his 13-year tenure to espouse Sunni Muslim ultra-conservative. Mr. Sewif “is a dangerous man to the national security of our country,” said Belgian state secretary for asylum and migration Theo Francken told RTBF. Mr. Al-Issa, the World Muslim league head, denied the allegations, noting that investigations of the mosque had cleared it of wrongdoing. The League, in a bid to counter criticism of the mosque returned its Saudi director, Jamal Saleh Momenah, to the kingdom, and replaced him with Tamer Abou el Saod, a Luxemburg consultant who has Swedish nationality. Mr Momenah, who like Mr. Alabri, enjoyed diplomatic status, was removed after deputies walked away from his parliamentary testimony in Arabic in March convinced that it would be impossible to work with him. “You can’t build an inclusive society with someone like that. This is an enemy of our Western values. He doesn’t even know the European Treaty on Human Rights,” said Flemish nationalist member of parliament, Christoph D’Haese. Mr. Sewif was succeeded by Ndiaye Mouhameth Galaye, a Senegalese national who teaches a more liberal interpretation of Islam but has yet to convince parliamentarians that he will take the mosque in a different direction. In an apparent underestimation of Belgian sentiment and the kingdom’s tarnished reputation, Saudi Islamic affairs minister Ibrahim Al-Zaid this week offered Belgian deputy foreign minister Dirk Achten to train Belgian imams. A “hypocritical suggestion,” quipped a Belgian news website.